Skate Tile. Good for Your Dude or Garage. I was excited to find this new collection from Imagine Tile and Art of Board today. 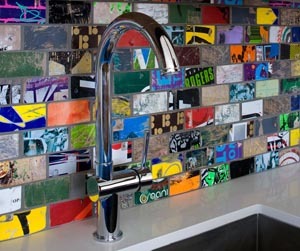 Skate Tile is described as a “photo-realistic tile that embraces a used skateboard’s scratches, gouges, and worn graphics.” I love it because it’d be great in a teen’s bathroom or in an industrial space like an upscale garage. Don’t laugh. There is totally such a thing as an upscale garage. What about being used in a space where teens gather? Our church has a thriving student ministry and I can see these tiles blending well with the existing industrial feel of their space. How about in an ad agency or engineering firm? It’d be a great backsplash for a break room counter and gives a funky, creative feel that those atmospheres are already known for. Either way, I’m officially in love with Skate Tile. Come to find out, these 3×6 wall tiles actually benefit skateboard charities like Life Rolls On (part of the Christopher and Dana Reeve Foundation), the Tony Hawk Foundation and Make-A-Wish. Buy your wall tiles through Art of Board’s Etsy site for $16/foot or order a sample of one of the 24 pieces through Imagine Tile for $2.75. When you decide you love it, call us! 804-592-9064. Previous Crayons in the Bathroom? Sure!